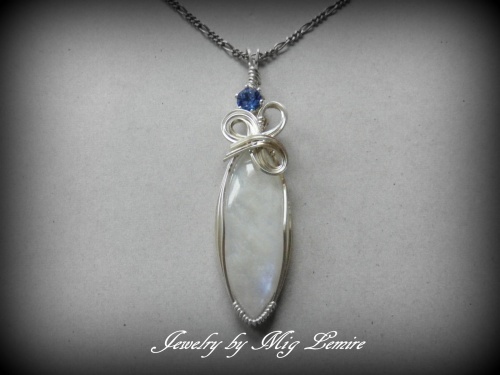 This elegant Rainbow Moonstone gemstone is so flashy and showy. Adorned with a 1 carat Swarovski Austrian crystal in Sapphire color bringing that blue flash out even more. Piece is sculpted in a sterling silver framework. Comes with a sterling silver chain. Measures 2 1/2" long from top of bail to bottom of pendant and 1/2" across. One of a kind piece.